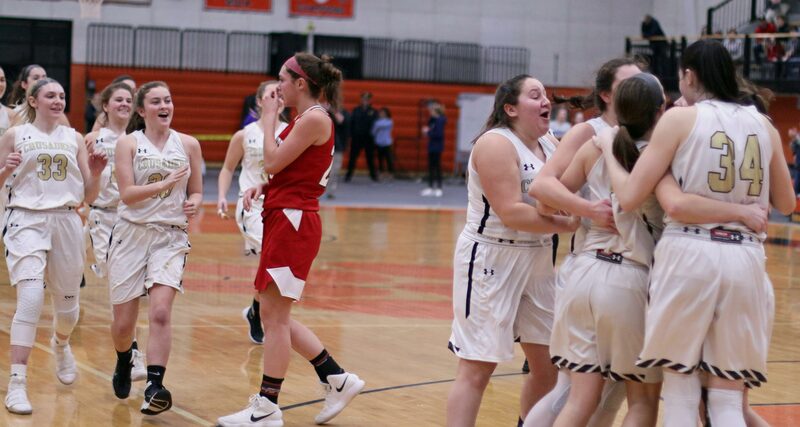 (Beverly MA) “This game literally came down to the last possession,” said Bishop Fenwick coach Adam DeBaggis afterwards. 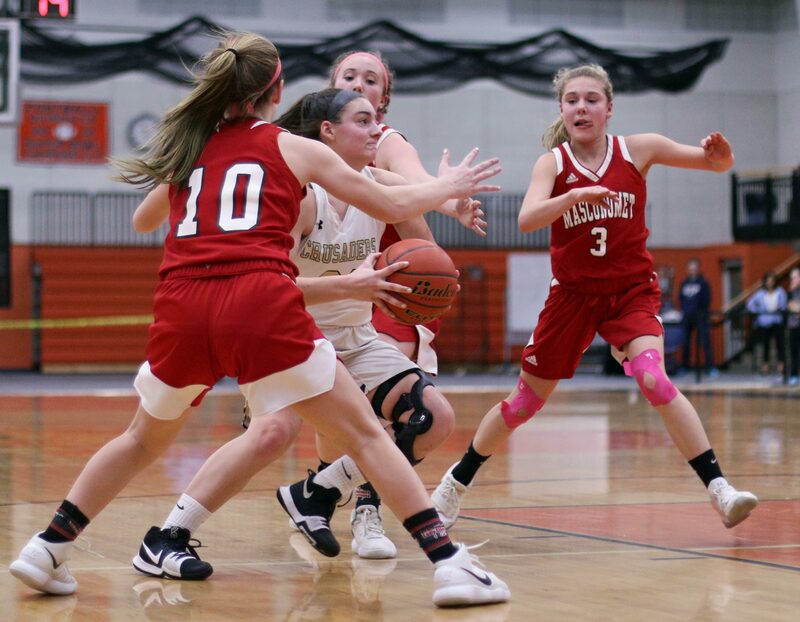 The Crusaders needed a stop against Masco and they got it to preserve a 33-32 win on Monday night in the finals of the McIntire Classic. 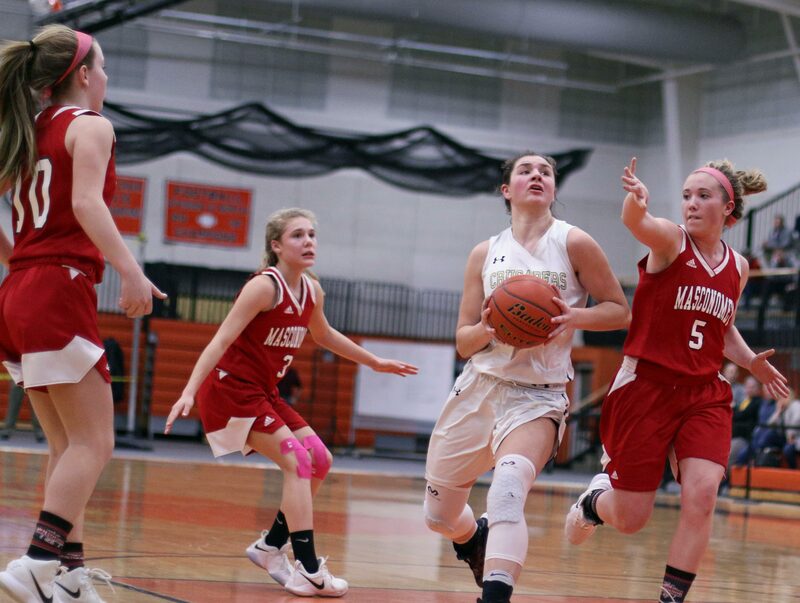 Mak Graves dribbled out Masco’s final fifteen seconds looking for an opportunity for some sort of shot but there were tall Crusaders inside and closely guarding Crusaders on the perimeter. 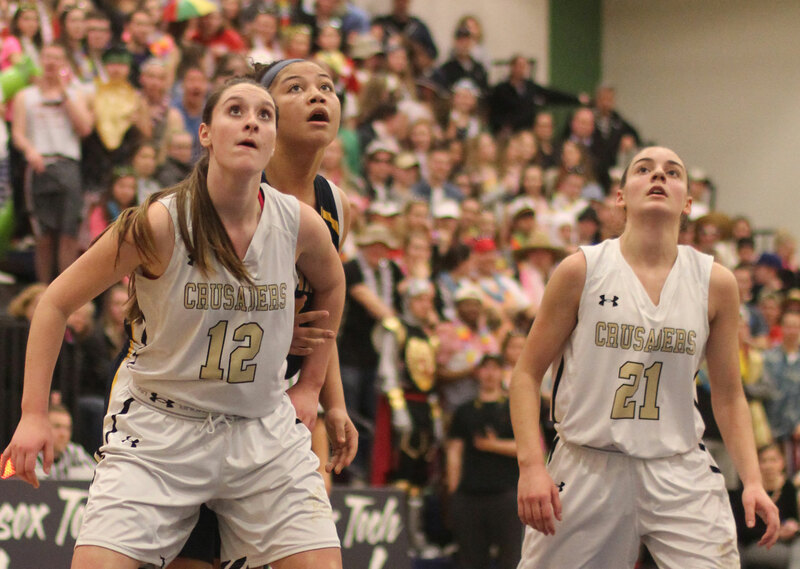 Mak ended up in the right corner with the tallest of the Crusader (Jennie Meagher) nearby and had her shot blocked as the game ended. 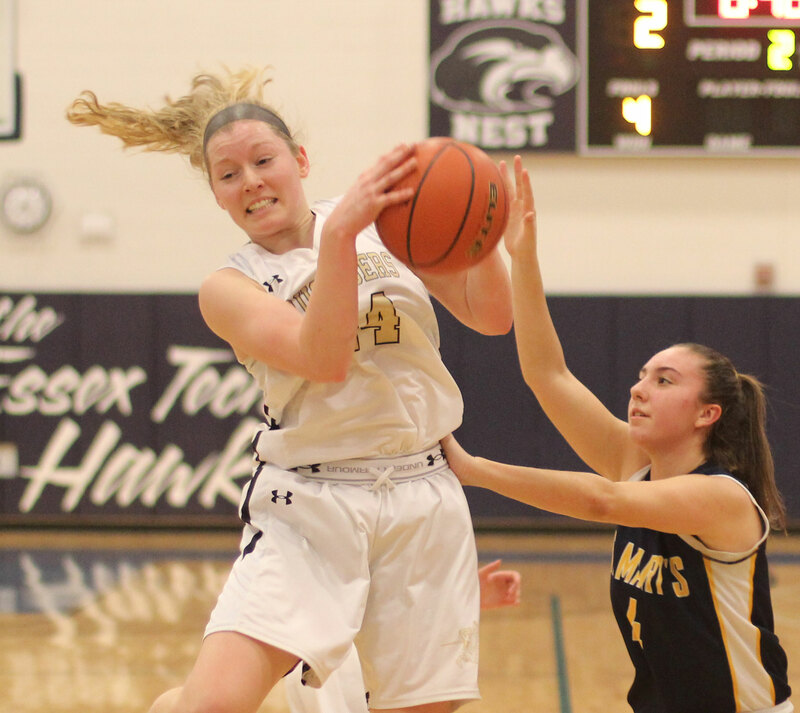 Junior Sammi Gallant had only three points but two of them were on a layup with twenty-one seconds left that turned out to be the game-winner. 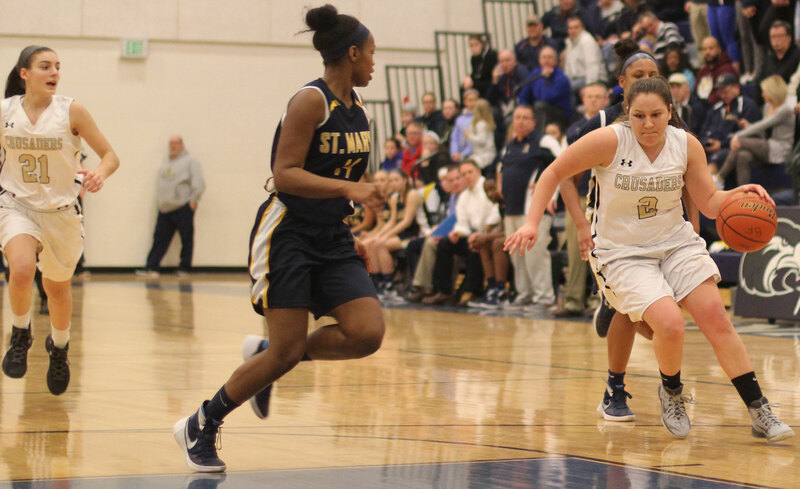 The Crusaders (11-9) used a zone defense and had the size and quickness to protect the rim and the perimeter. Masco was in a straight in-your-shirt, man-to-man defense. BF was able to get to the foul line twenty-three times because of their willingness to drive to the hoop. Another reason this game stayed close? 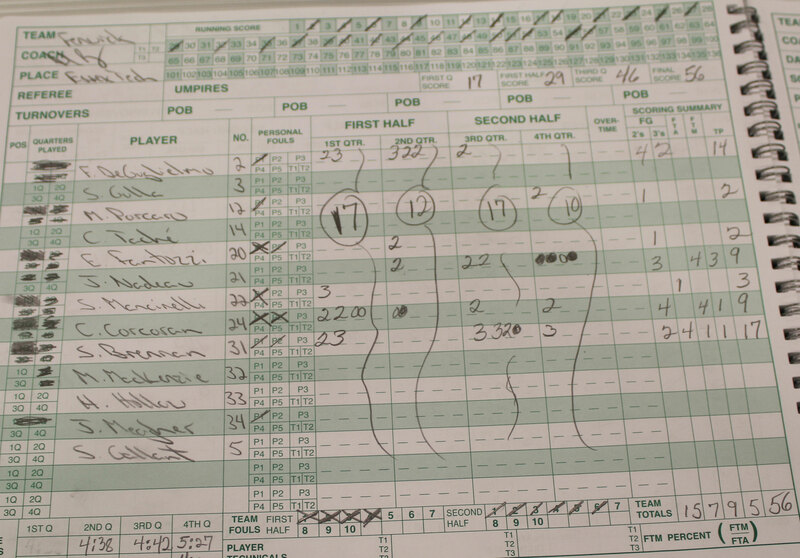 The Crusaders missed fourteen free throws. 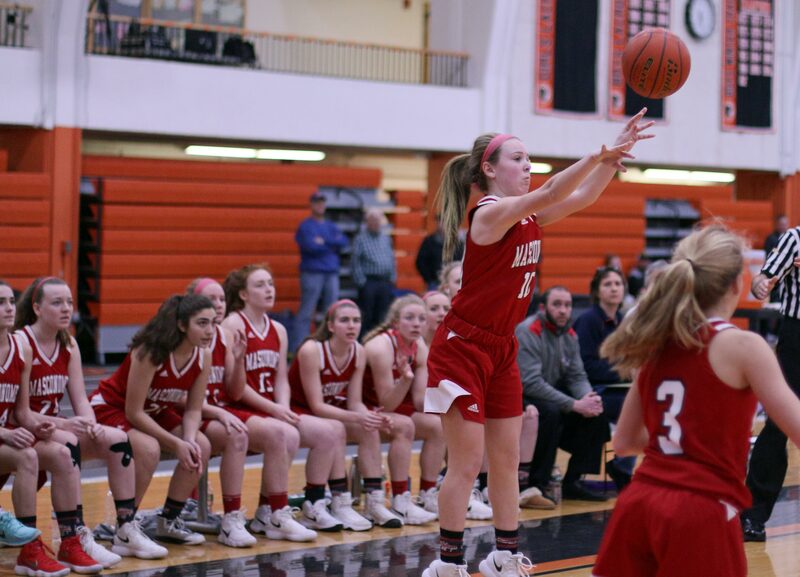 The Chieftains had trouble getting good shots and got into trouble (twenty turnovers) forcing the ball in close to the basket. There were twelve lead changes and six ties in this game. 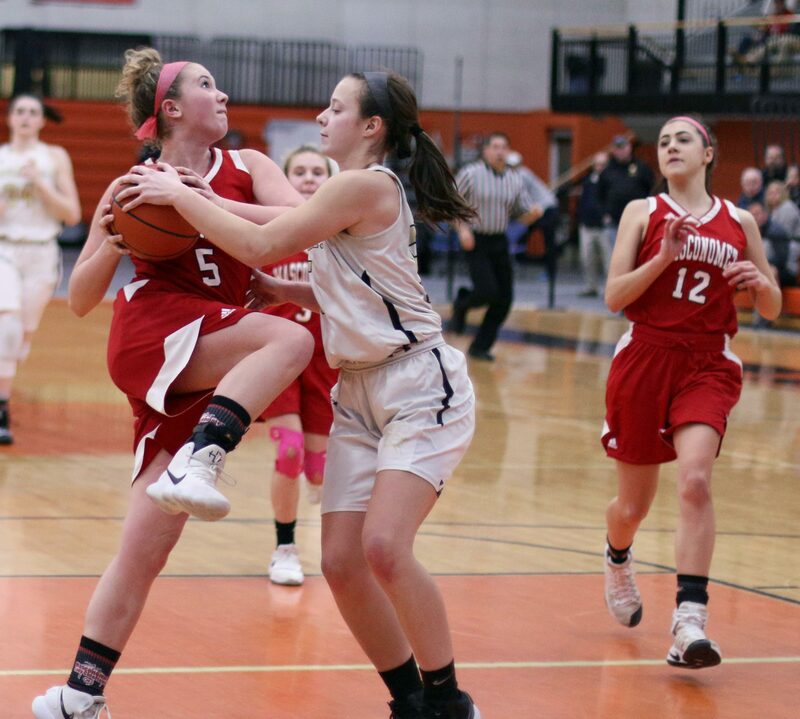 Masco took a one-point lead (24-23) into the final quarter. The team from Peabody ran the first seven points of the final quarter and led 30-24 with 3:21 remaining. 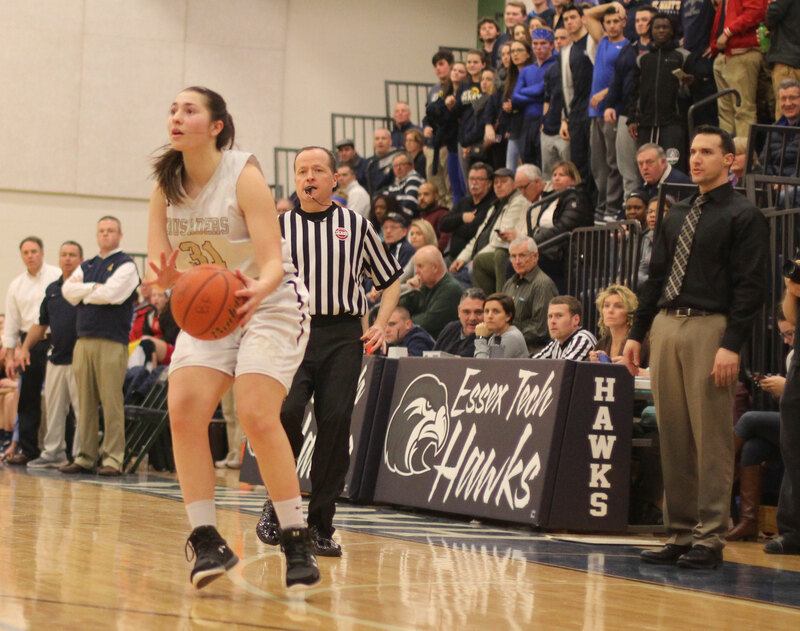 Liz Gonzalez had a layup and a free throw while Sammi Gallant added a free throw in this segment. 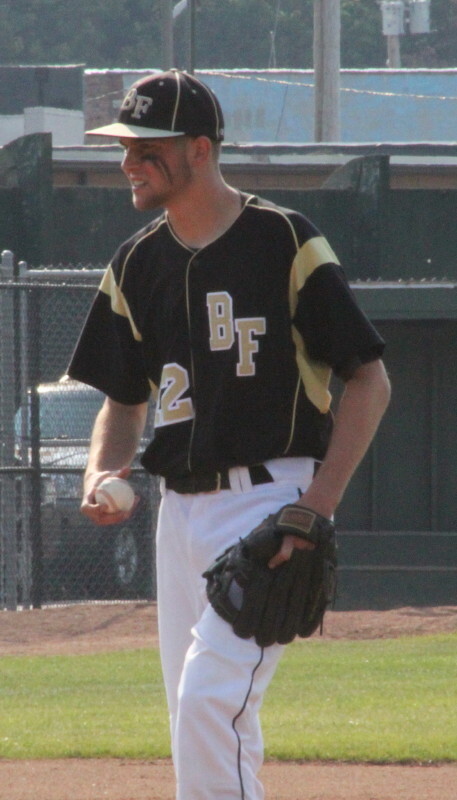 A crowd-pleasing three by senior Fredi DeGuglielmo ended the run of points for BF. “We didn’t panic when we were down by six in the last quarter,” recalled Coach Romeo. 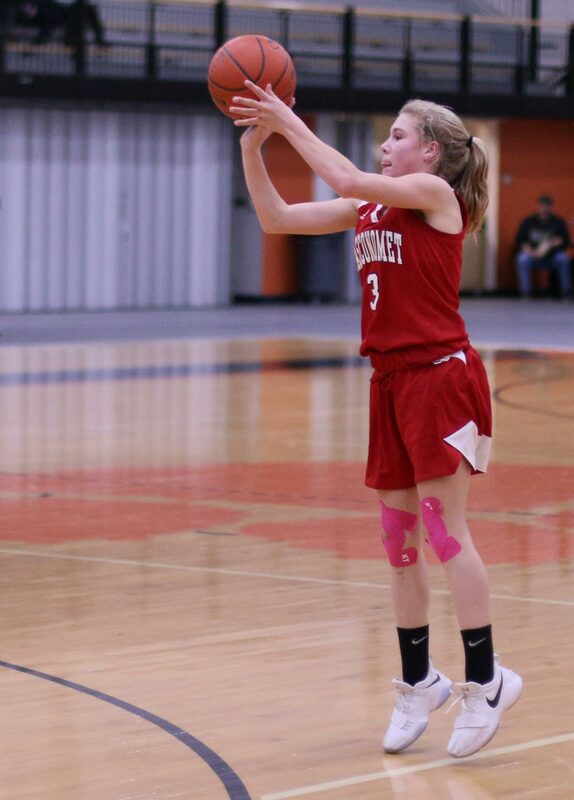 An NBA three by freshman Morgan Bovardi was followed by a Mak Graves steal that turned into two made free throws. 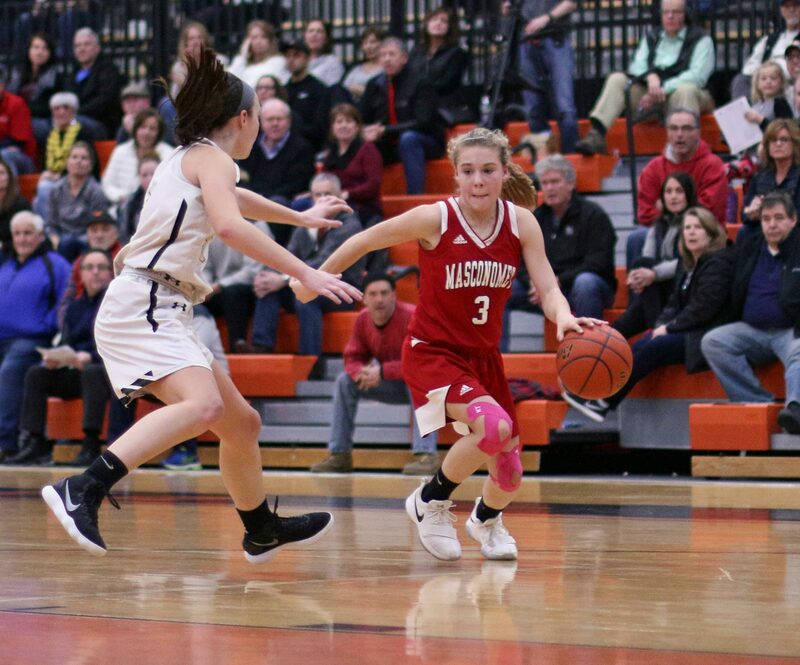 Now down by one (30-29), Morgan put the team from Boxford in front with a three from in front of the Masco bench and suddenly they were ahead, 32-30, with 1:52 remaining. The Crusaders didn’t panic either. On two straight possessions they got the ball in close. 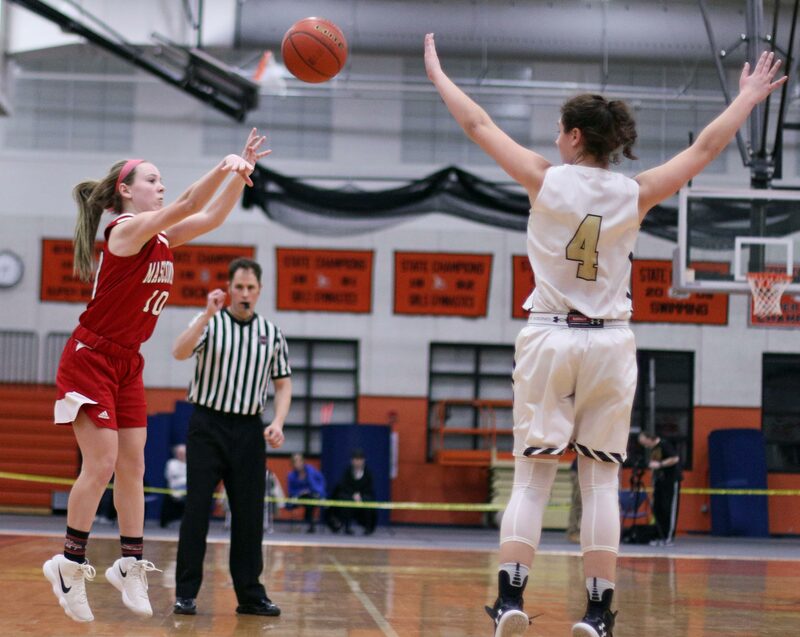 Jennie Meagher got a free throw out of one possession while teammate Sammie Gallant had the eventual game-winning down the right side with 21 seconds left. 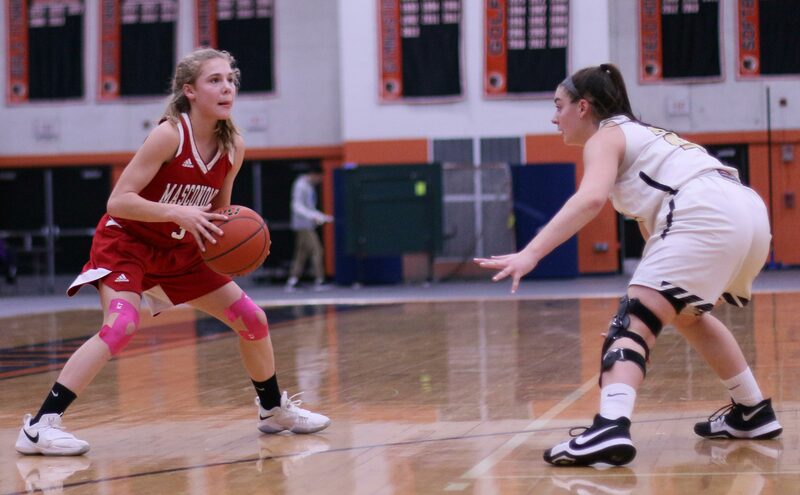 Between those two possessions Masco had its 20th turnover. 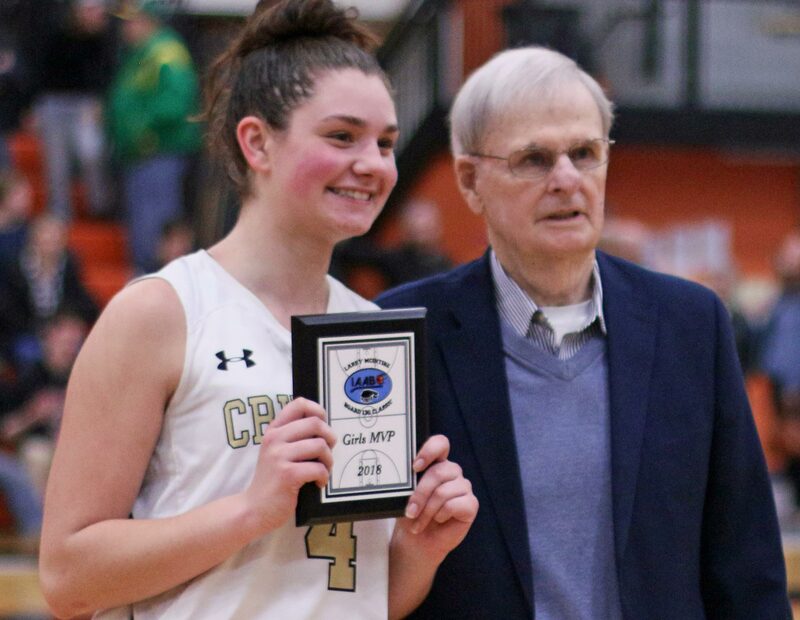 Olivia DiPietro ended with ten points and was named the tourney MVP. 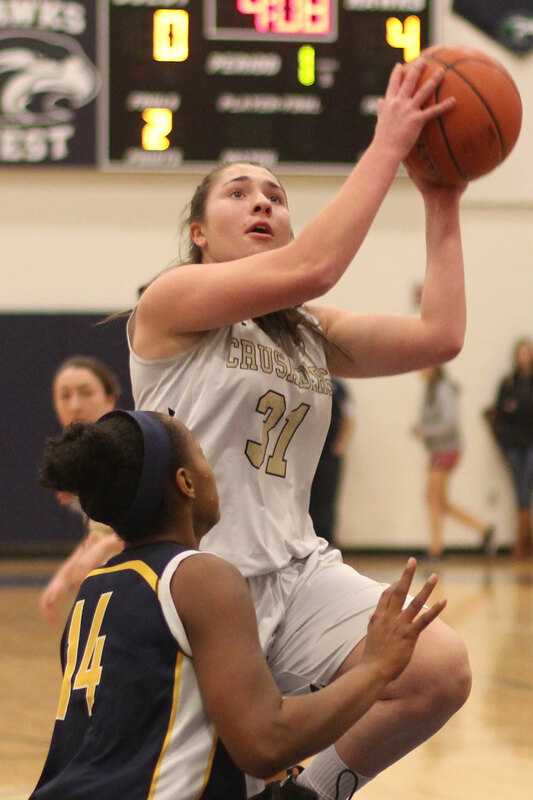 Jennie Meagher had only six points but her twelve rebounds and three blocks (including the one on the last shot) were important pieces in the BF win. 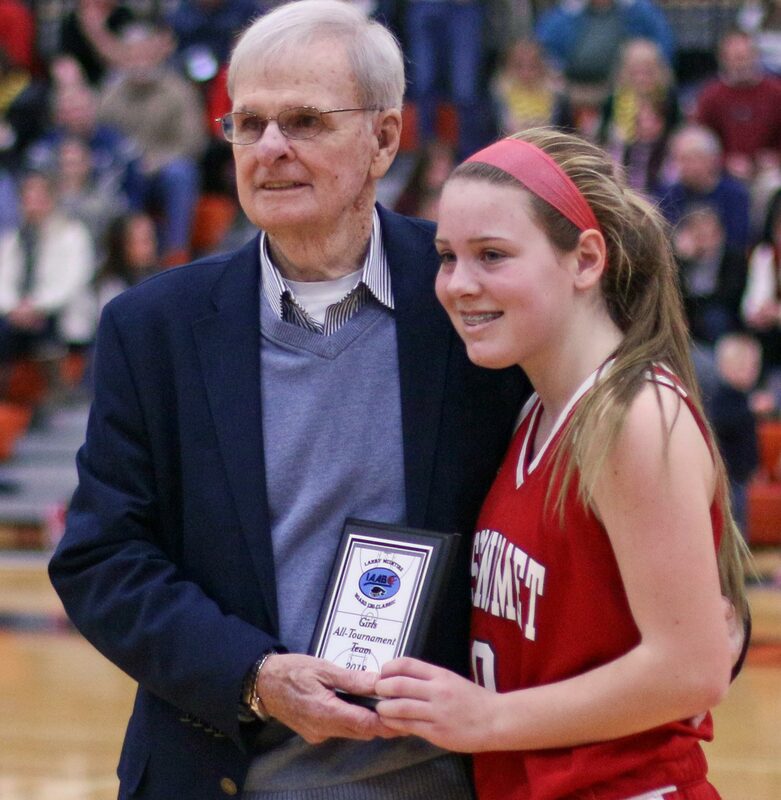 Morgan Bovardi (14) and Mak Graves (12) were the top Masco scorers. Morgan made the all-tourney team. 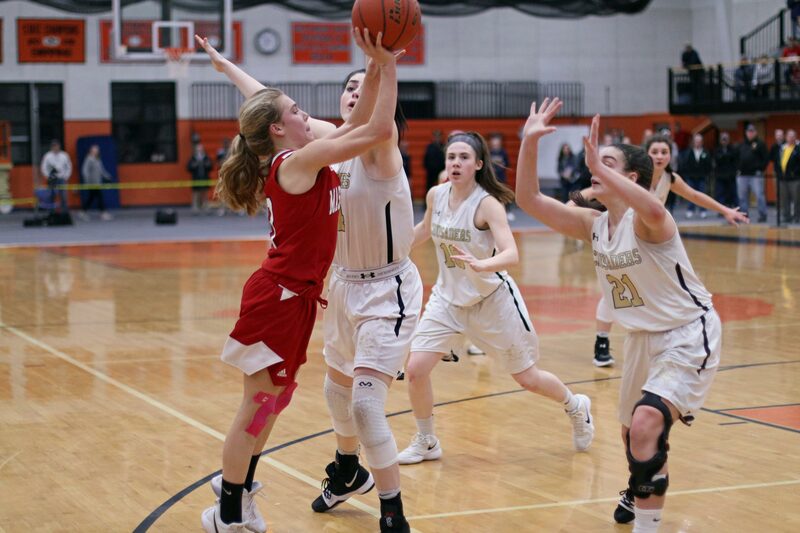 (Hathorne MA) Bishop Fenwick (20-4) had all the right answers as they eliminated St. Mary’s, 56-40, on Tuesday night at Essex Tech in the D3 North semi-finals. The Crusaders had a glittering first period putting up seventeen points while the Spartans could manage only two points. 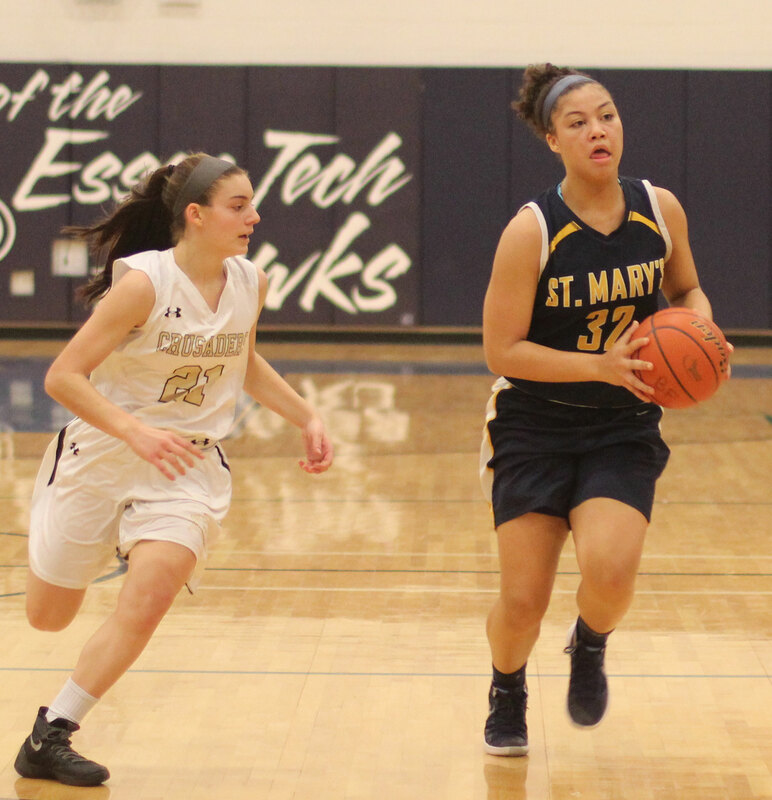 St. Mary’s (19-5) would get within ten (21-11) 3 ½ minutes into the second quarter but BF answered with eight straight points (layups by Ellen Fantozzi and Jaxson Nadeau, drive and jump shot by Fredi DeGuglielmo) before the quarter ended. 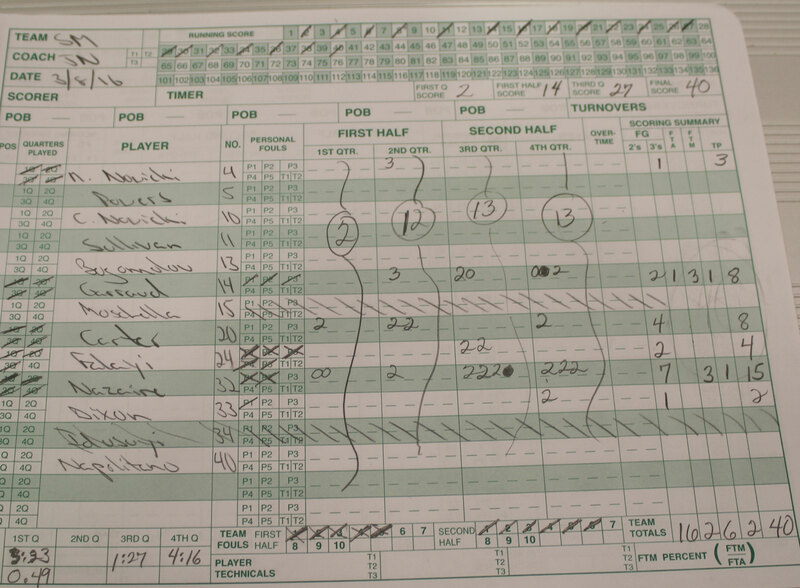 On a night when the Spartans struggled from long range (two 3’s) the Crusaders nailed seven. 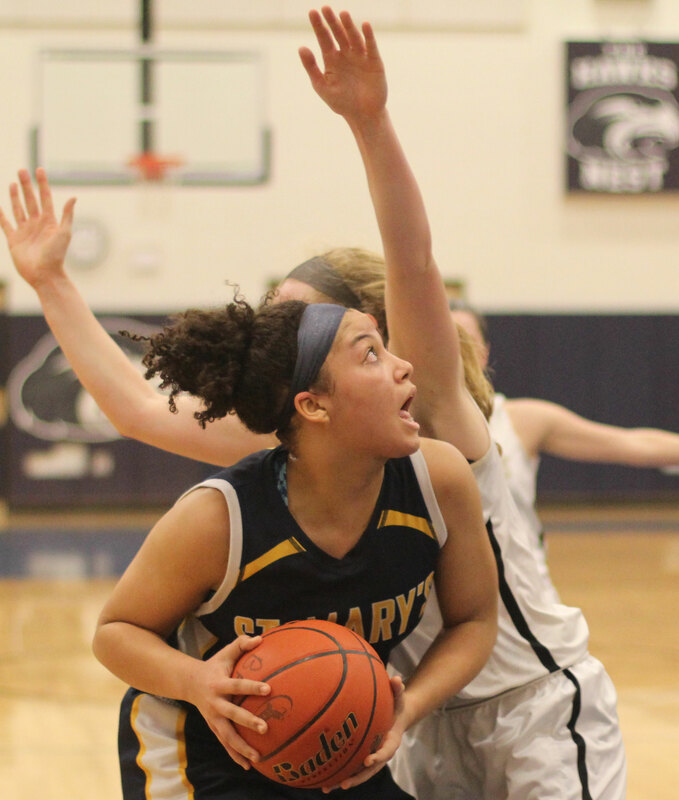 Senior Sydney Brennan (17 points) clicked four times from deep including two in the second quarter. Sophomore Fredi DeGuglielmo (14 points) notched two 3-pointers. St. Mary’s 2-point first quarter surely brought back memories of the two team’s previous get-together on February 12th. 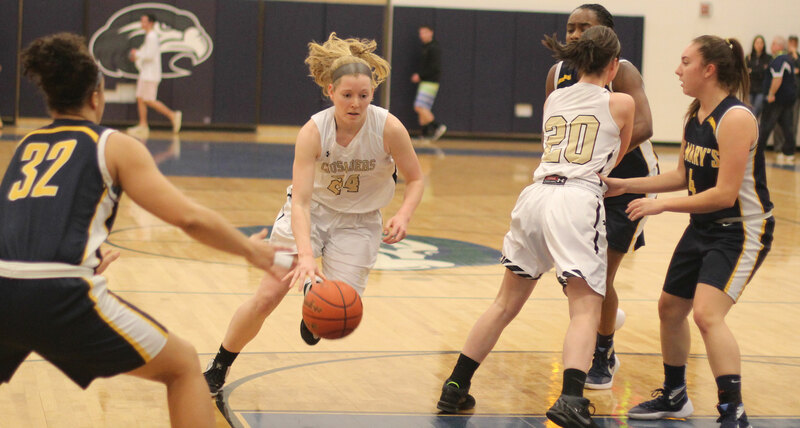 In that 45-27 loss the Spartans were held scoreless in the first half. 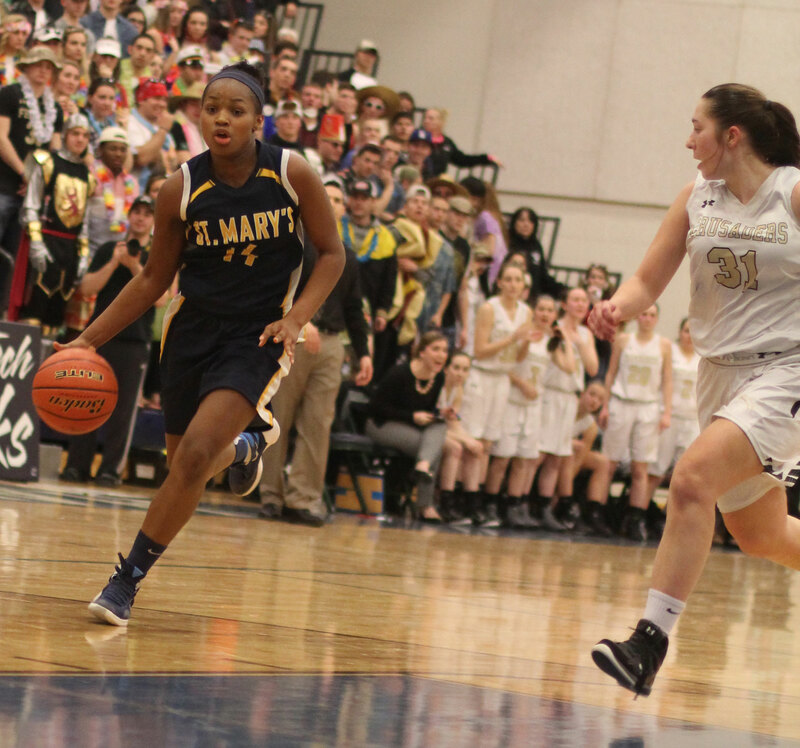 The Crusaders full-court pressure paid dividends garnering turnovers (eight in the first quarter) and forcing St. Mary’s to play much faster than they wanted to. The Spartans rushed their way into a bunch of high-percentage shot misses. 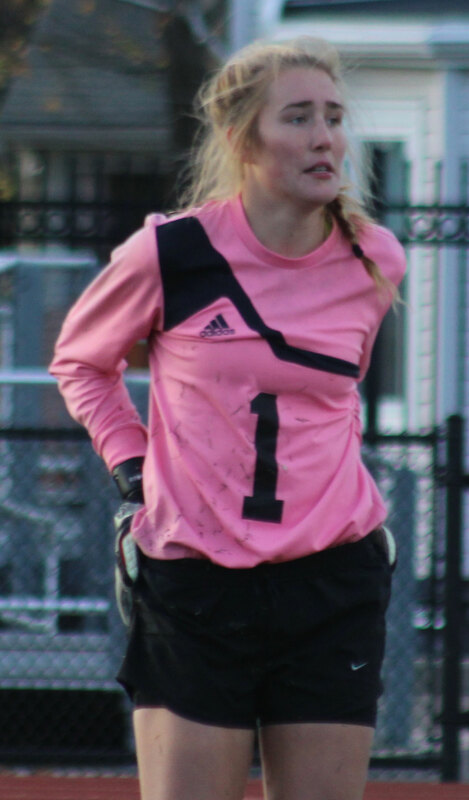 Key player in the game in my opinion was Colleen Corcoran. She got BF off to a good start with the game’s first two baskets. She ended up with nine points and eleven rebounds. To me her greatest value was being the outlet in the backcourt. St. Mary’s applied plenty of pressure too but when BF’s primary ball-handlers were in trouble Colleen was there to get the ball up the court for them. 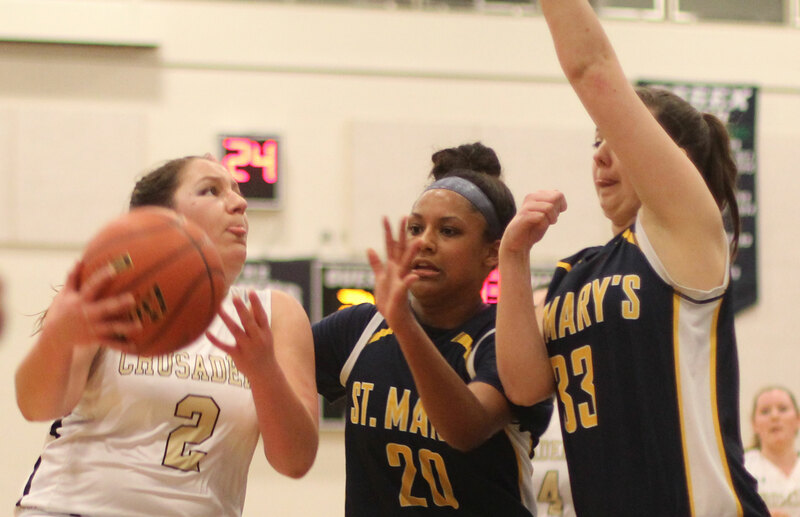 St. Mary’s had five turnovers in the first two minutes. Most of the miscues were from bad passes. BF went out 6-0 on two scores by Colleen and a runner by Sydney Brennan. 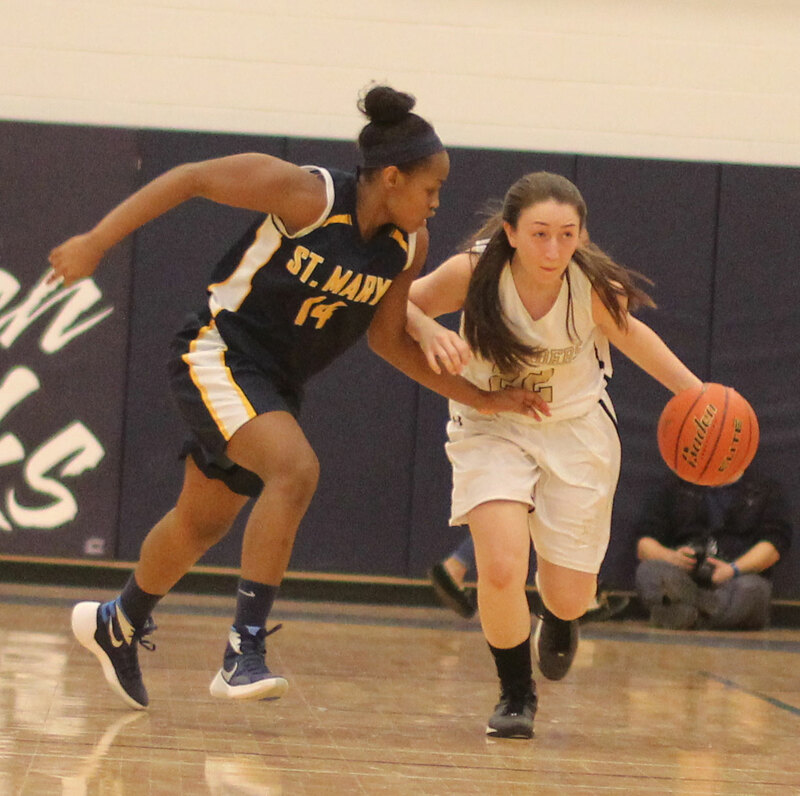 Senior Kayla Carter broke the ice for STM converting a rebound 4 ½ minutes into the quarter. It would be five minutes of game time before the team from Lynn would get more points. 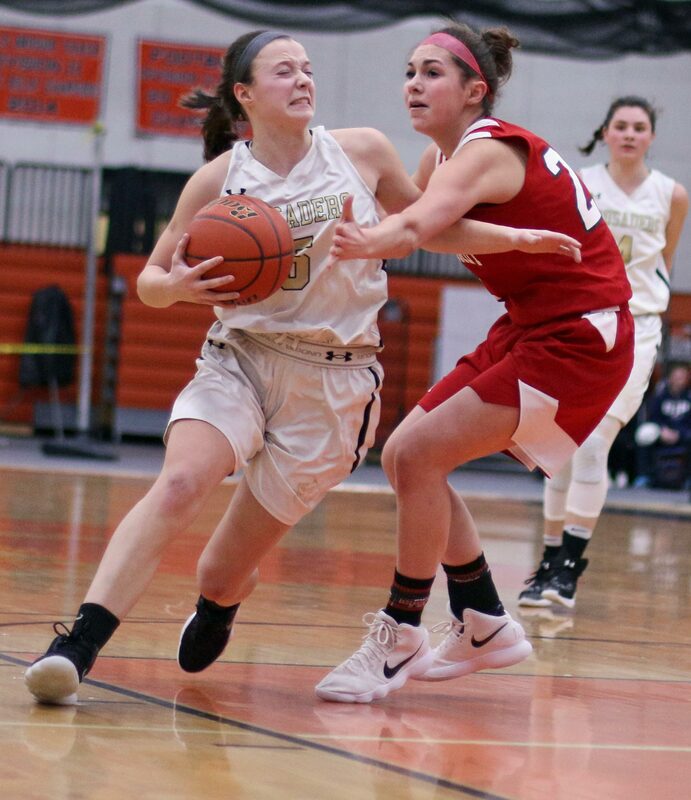 And while the Spartans struggled to score, the team from Peabody struck three times from deep (Sam Mancinelli, Sydney Brennan, and Fred DeGuglielmo) before the first quarter was over. Down by fifteen after one period, the Spartans moved to within ten after a layup by Kayla Carter and a three from Mia Nowicki. But the Crusader then ran eight unanswered and BF led by eighteen (29-11). Marnelle Garraud drained a three in the final minute but BF still led 29-14 at the half. 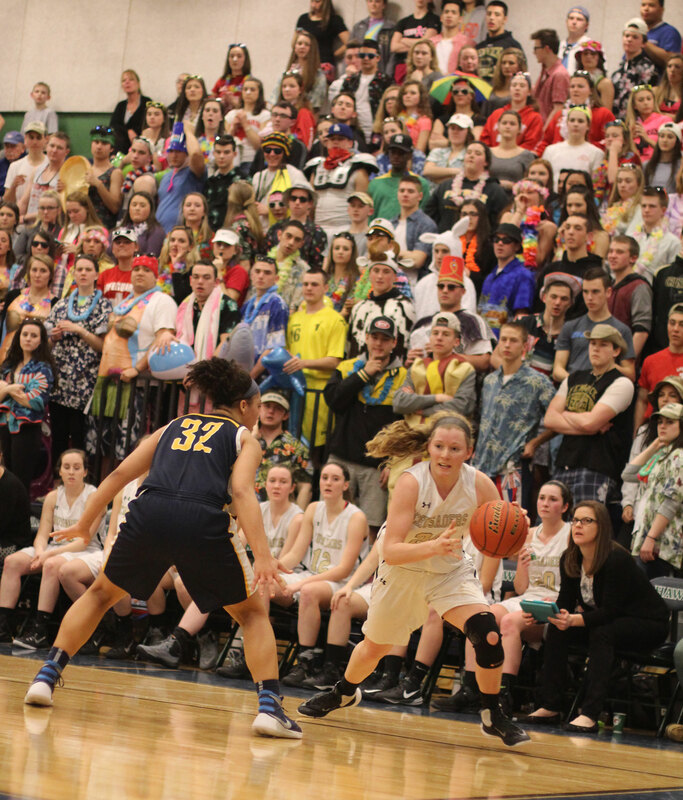 You might imagine that in the second half St. Mary’s would start making some shots, especially long-range, and that Bishop Fenwick would cool off. Didn’t happen. 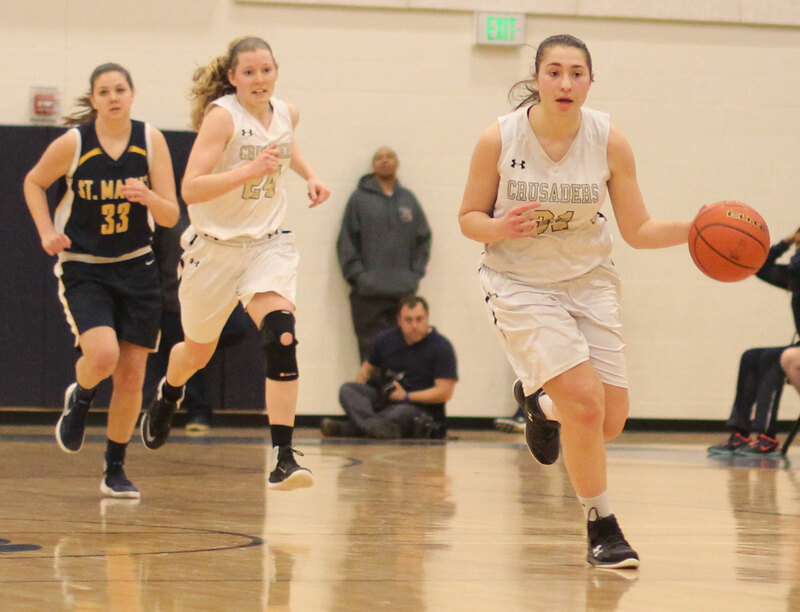 Sydney Brennan doused any comeback plans by St. Mary’s with three 3’s in the first four minutes of the second half to usher BF into a 40-20 spread. The Crusaders collected only one point in the final 4+ minutes of this game but the Spartans on this night couldn’t put any long-range accuracy together to get close. Sophomore Olivia Nazaire (15 points) collected thirteen of her points in the second half. 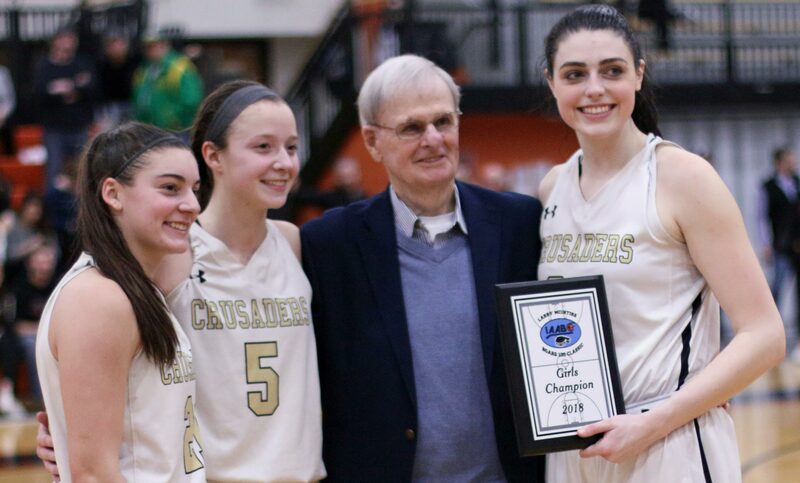 What a season so far for Bishop Fenwick! They won their first Catholic Central League title since 1997. They also ended eight years of losing to St. Mary’s and have now defeated the Spartans all three times they met this season. 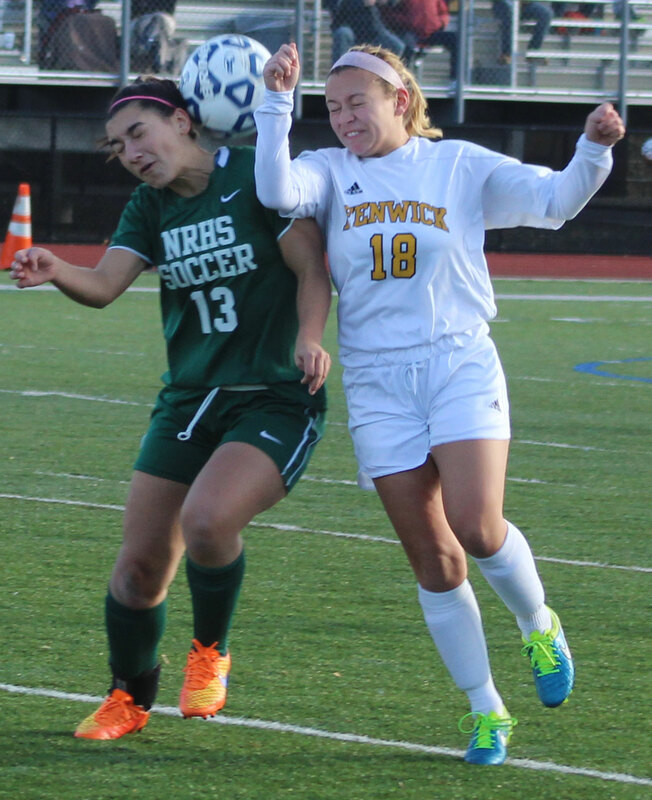 Bishop Fenwick moves on to the D3 North title game on Saturday. They will face the winner of the Latin Academy/North Reading game. The Crusaders lost in the D3 North title game last year to Winthrop. 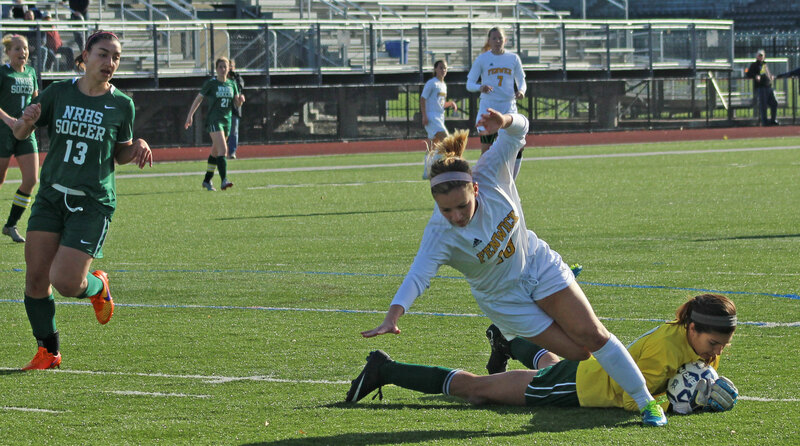 To call Bishop Fenwick’s defense “swarming” may have been an understatement. There were very, very few open looks for St. Mary’s from anywhere. BF had some breakaways from the Crusaders’ twenty turnovers. 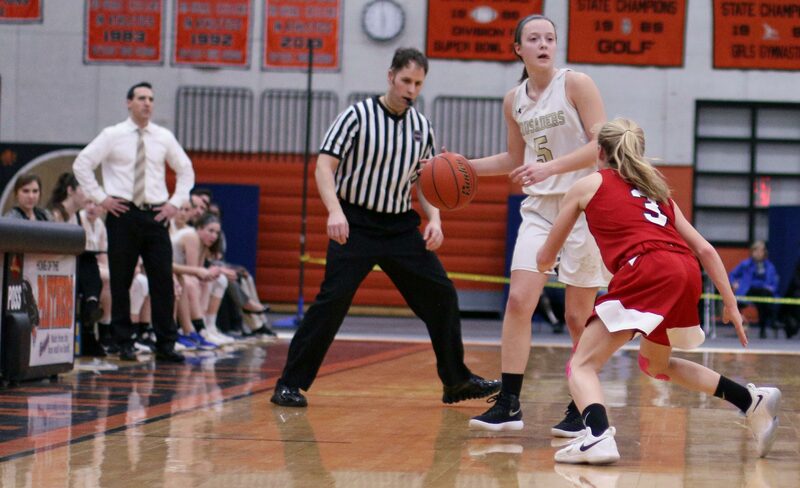 Colleen Corcoran has committed to play basketball for the LeMoyne Dolphins (Syracuse NY) next year. LeMoyne is in the Northeast-10 Conference. Merrimack and Southern New Hampshire are also in that conference. First time at Essex Tech for me. Impressive. The seating was steep but it gave everyone a good view of the game. 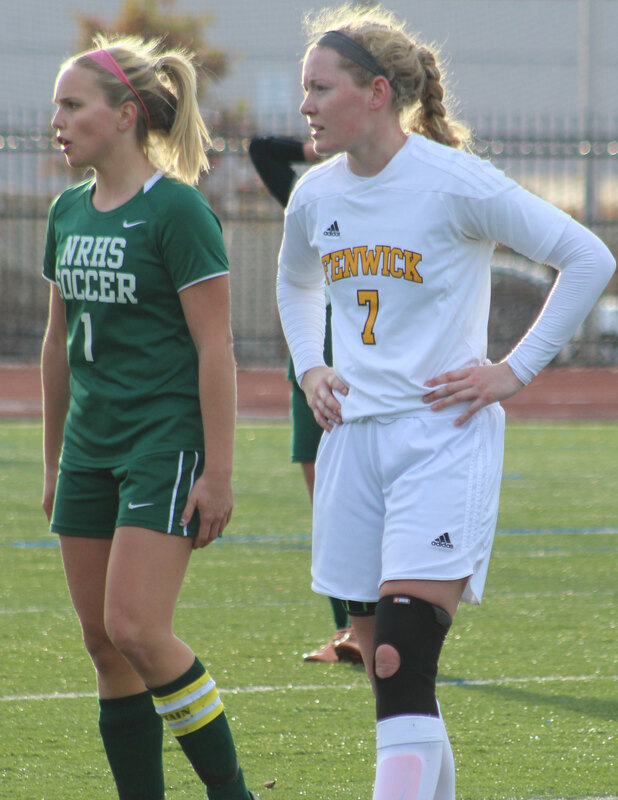 (Lynn MA) Sophomore Rachel Hill scored a goal in the first half and assisted on the game-winner in the second half as North Reading defeated #2 Bishop Fenwick, 2-1, to win the Division 3 North title on Sunday afternoon at Manning Field in Lynn. The #5 Hornets (17-3-2) will face D3 South winner Medway (17-1-3) on Wednesday night (5PM) in the D3 state semi-finals at Manning Field. Medway was the #1 seed in the South. 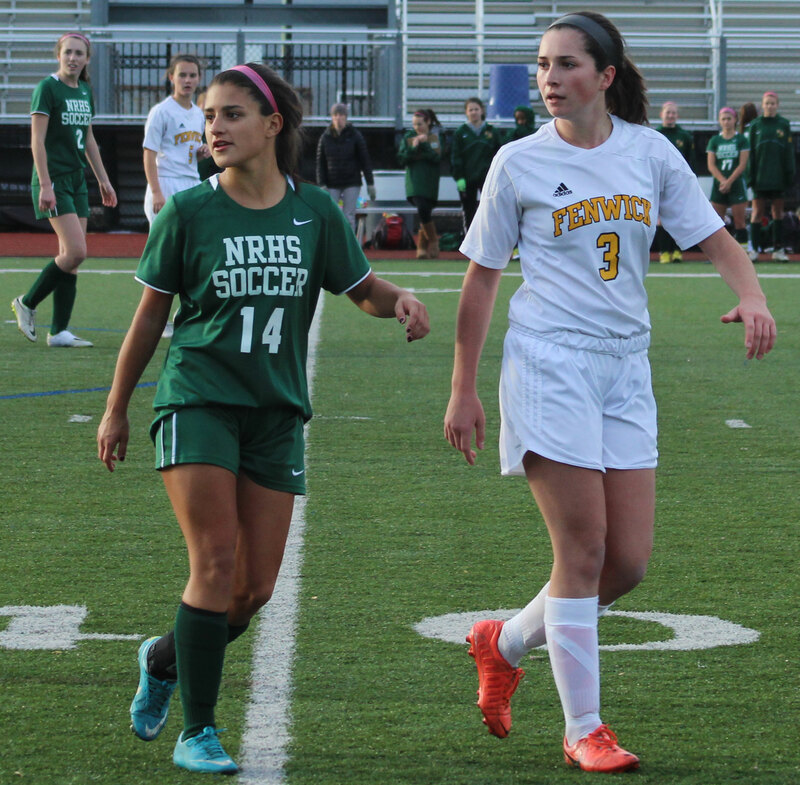 The NR win avenges a 1-0 loss they suffered against the team from Peabody in late October. Rachel Hill’s goal came very late in the first half. 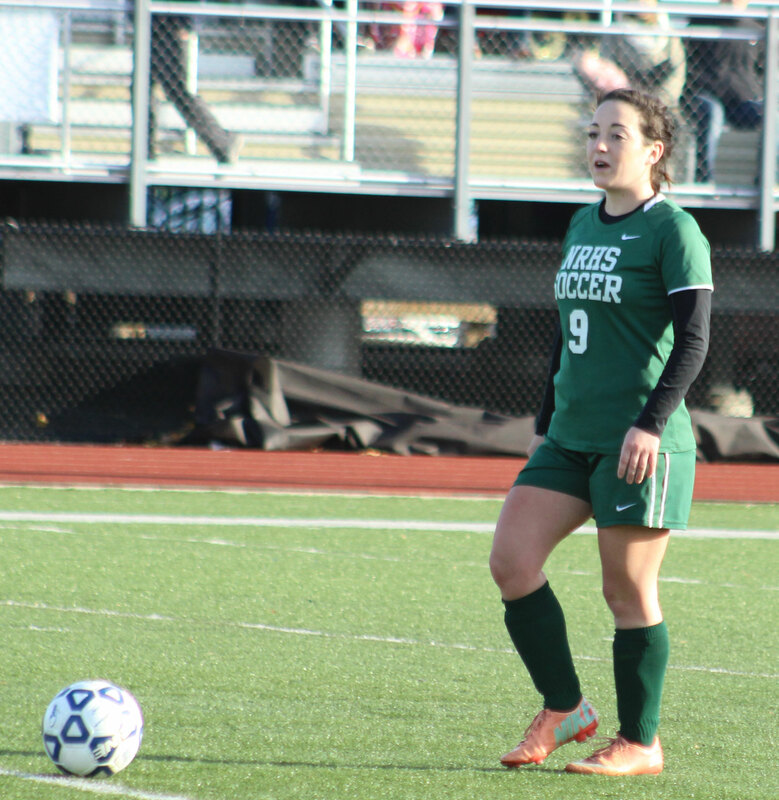 After getting a pass from Marissa Zarella, Rachel dribbled across the middle of the box from right to left. GK Merry Harrington moved over to cover and Rachel, as she was going down, hit a grounder past her. Rachel’s roller reached the far corner of the goal with less than two minutes to play in the half. At 31:04 of the second half the Crusaders evened things. 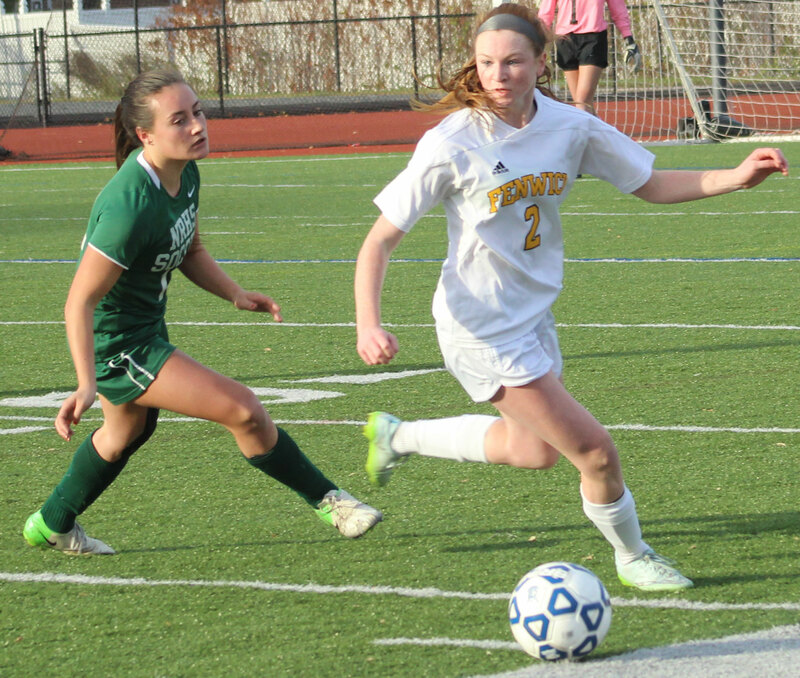 Seniors Colleen Corcoran and Danielle DelTorto combined nicely on the score. Danielle carried down the left side and sent Colleen a delicious cross into the box. 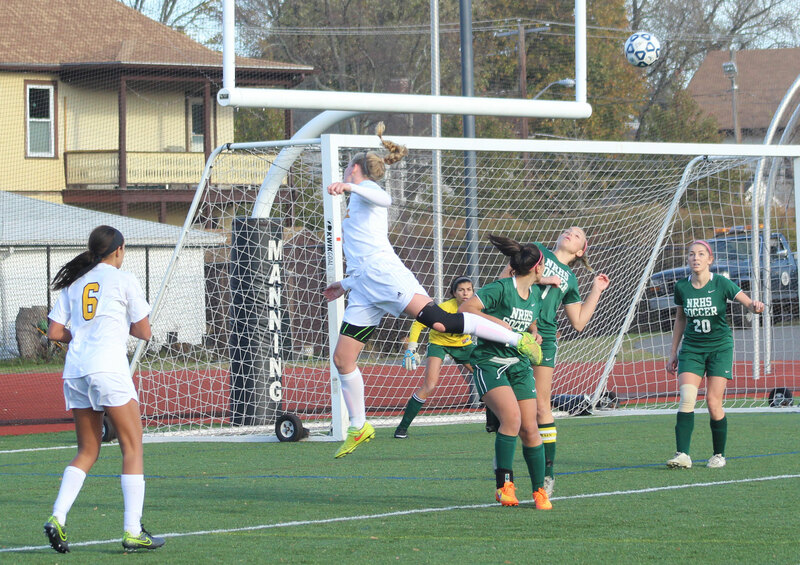 Colleen got a straight-on blast off the sailed over GK Kat Hassapis’ head. 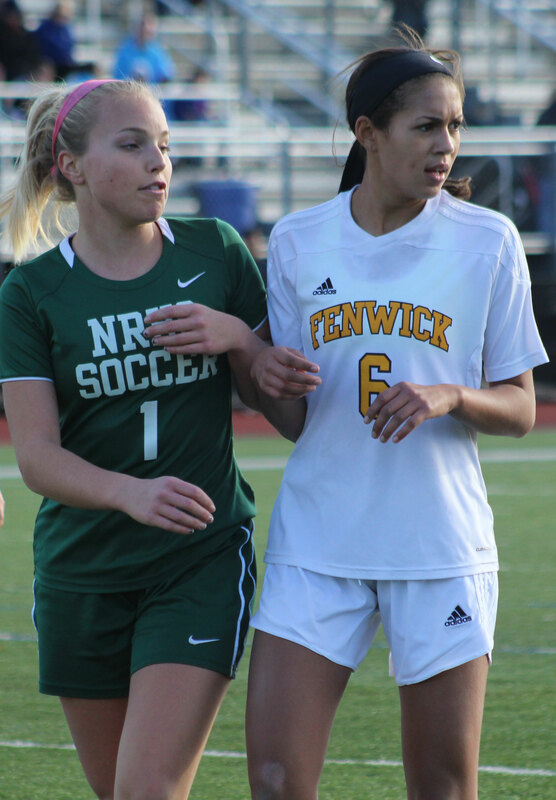 The Corcoran/DelTorto connection tallied the only goal in the Fenwick win over North Reading in the regular season. 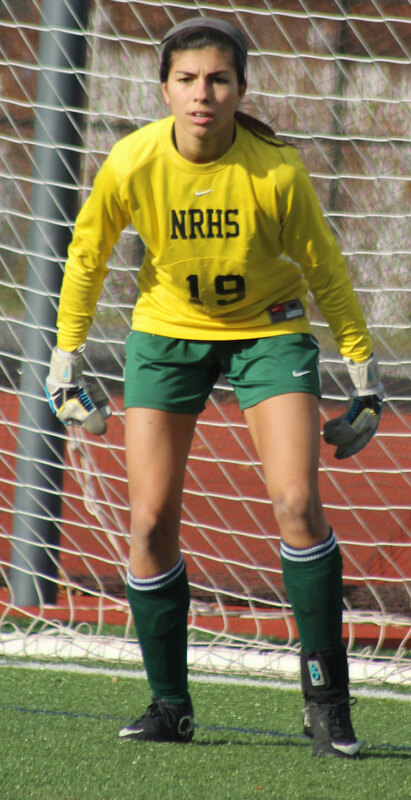 Sixteen minutes later (15:36) North Reading put in the goal that keeps their season going. Rachel Hill sent junior Haley Nathan ahead along the left side. 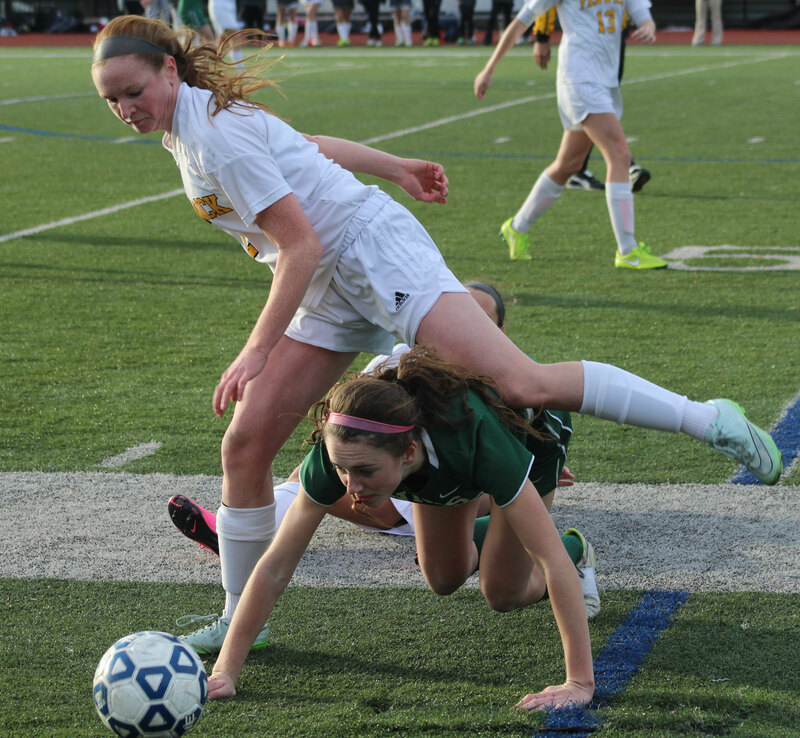 Haley had defender Emily Charette to her right. 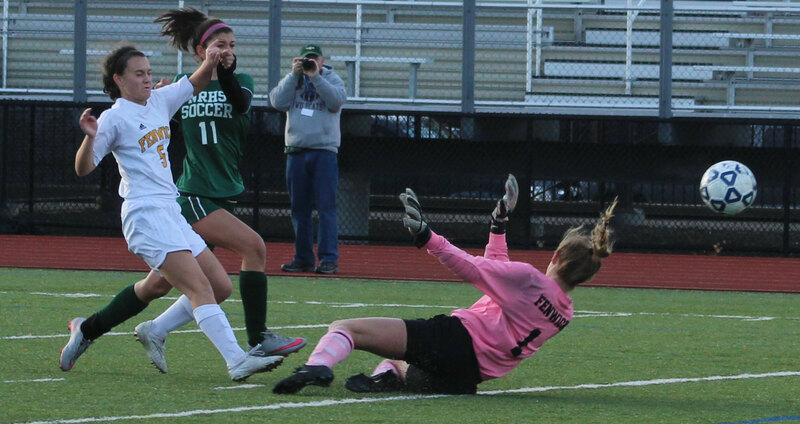 GK Merry Harrington moved over and out to protect the net. Haley was able to get off a shot that went by Merry and rolled into the goal. Both of the NR goals were on the ground with a lot less than lightning speed on the shots. It isn’t always the hardest hit shot that gets the job done, at least not in this game. 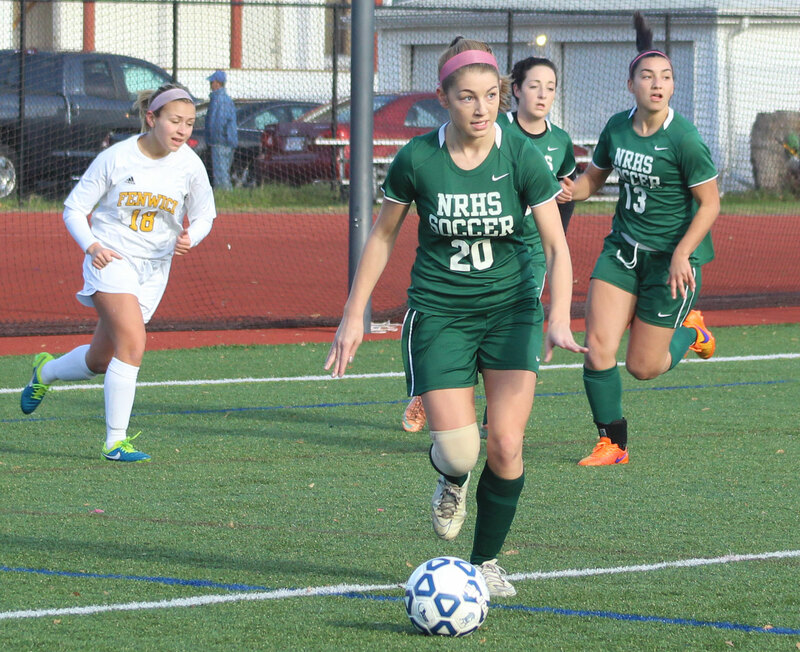 Colleen Corcoran hit a crossbar in the first half. 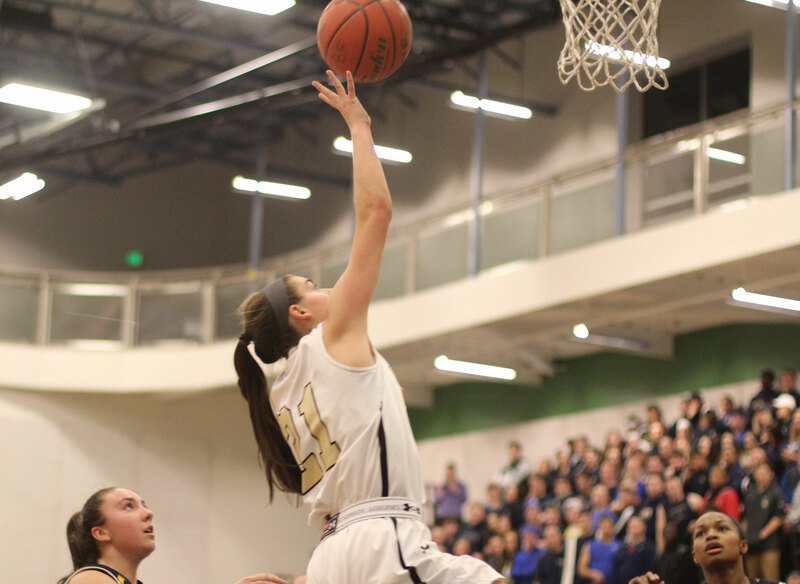 Katie Welch had a near-miss for the Hornets from long range in the second half. Beautiful day for mid-November in these parts……50’s and sunny. The scoreboard at Fraser Field at the end of the game Wednesday afternoon. 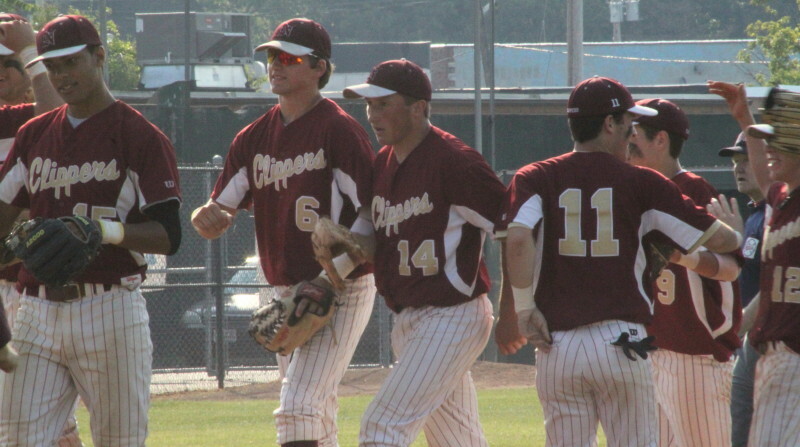 Pitcher Ryan O’Connor (#14) in the midst of the celebrating Clippers afterwards. (Lynn) Newburyport is on its way to the D3 North finals on Saturday at LeLacheur Park in Lowell at 2PM after defeating Bishop Fenwick, 3-0, on sunny Wednesday afternoon at Fraser Field. The Crusaders (18-7) were limited to four hits by Ryan O’Connor and only one of their runners reached second base. The game was scoreless until the bottom of the fifth. The Clippers (20-5) run came as Sam Barlow singled up the middle, stole second, and scored on Colby Morris’ single to right center. 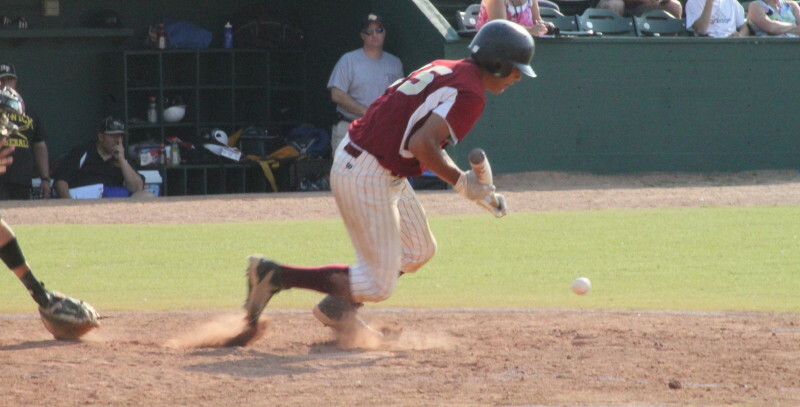 Newburyport added two insurance runs in a wild sixth inning. Brett Fontaine and Jim Conway started the inning with singles. 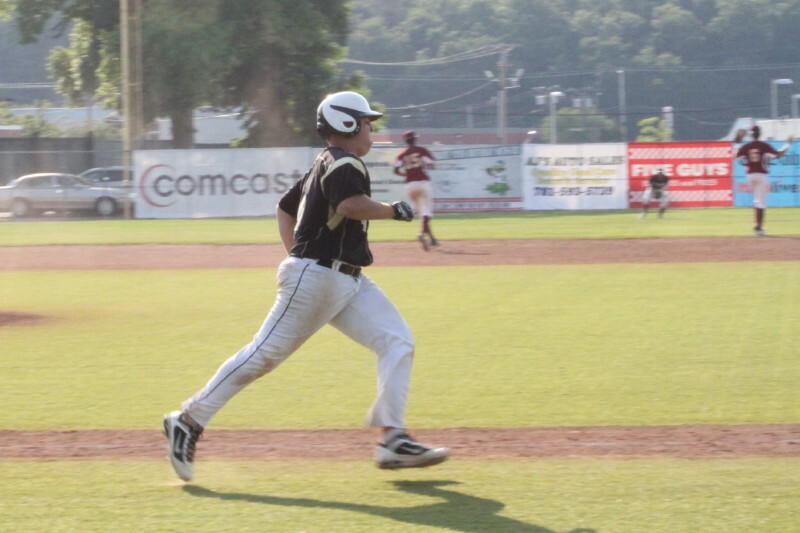 Drew Carter tried to sacrifice bunt the runners along but ended up with a single when the catcher (Gianni Esposito) chose to go for the force at third and was unsuccessful. That loaded the bases. Drew Carter’s sacrifice bunt attempt turned into a key hit in the Clipper 6th. Connor Wile fouled off a number of pitches before drawing a walk that forced in Run #2 (Brett Fontaine). 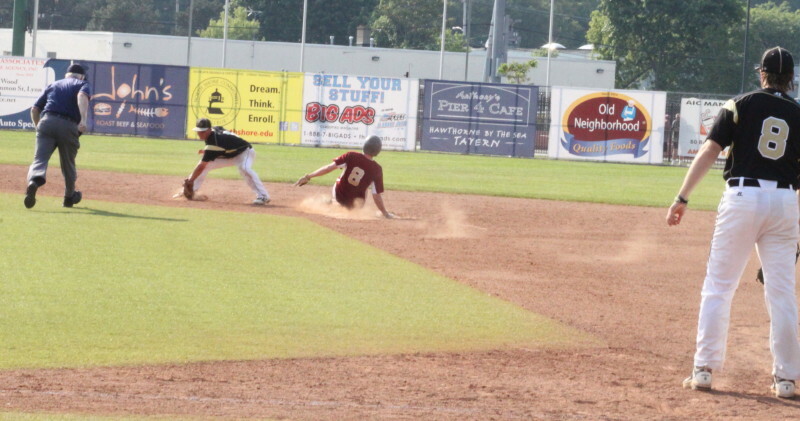 With one out, David Cusack tried a safety squeeze that nearly worked but went foul. Then the runner (Jim Conway) he was trying to squeeze got picked off third. Now taking a normal swing, David singled through the right side of the BF infield and speedy Drew Carter scored from second with Run #3. With Ryan O’Connor pitching, those three runs held up. Ryan had six strikeout victims including the last batter of the game – Gianni Esposito. Yankee Hall-of-Fame pitcher Lefty Gomez was credited with saying, “The secret of my success was clean living and a fast outfield.” That quote came to mind when I reflected on this game. 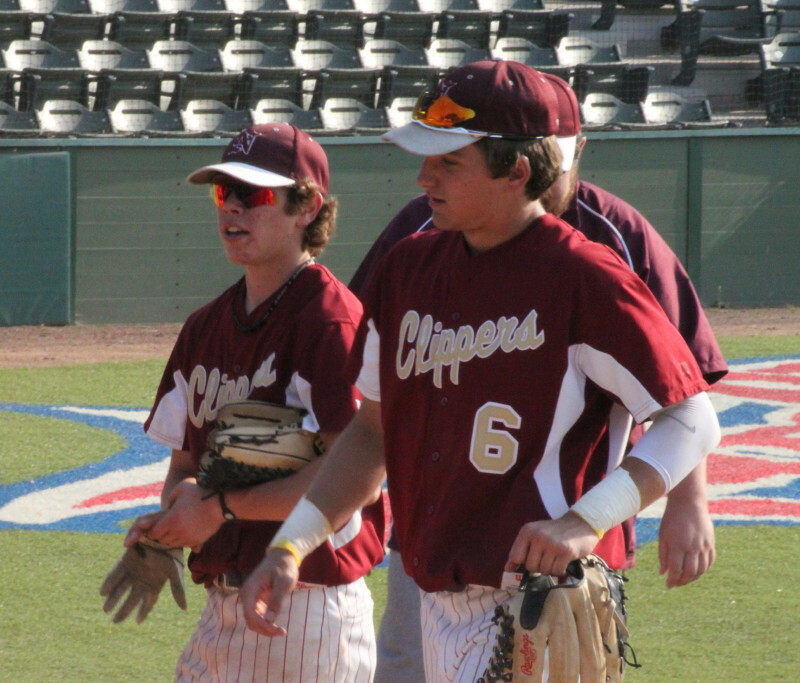 Newburyport outfielders David Cusack and Sam Barlow made running catches that saved runs. David Cusack had a great catch in the second and an RBI in the 6th. David’s was in the second. Mike Cipriani was on first when Jake Bugler hit one deep into the right center gap. David brought that shot in on the dead run. On the Fraser Field turf that ball could easily have been a double with a run scored. Sam’s turn for a great catch was in the seventh. 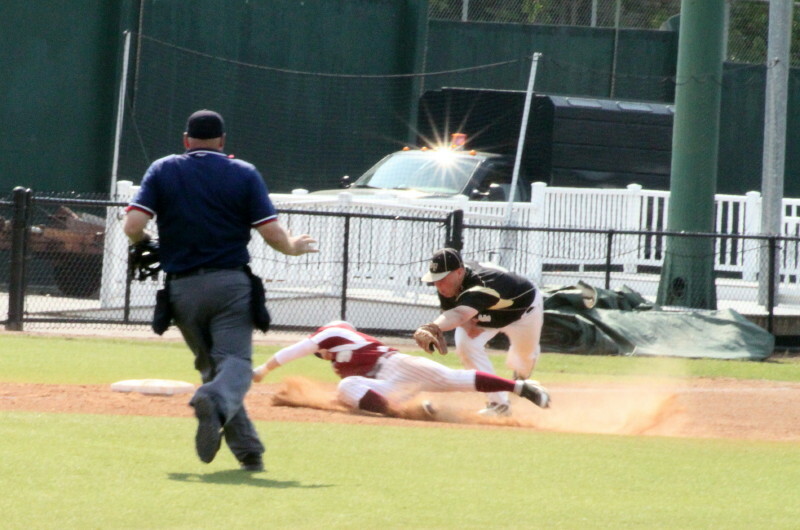 This time it was a liner by Mike Cipriani that Sam speared on his way toward center field. If that ball gets into the gap it’s a double and possibly a triple. That catch was especially important because the next batter (Jake Bulger) hit a single. In my opinion, those two outfielders saved at least two runs. In a 3-run win those plays were crucial to say the least. David Cusack was back at the top of the order after missing two games with an ankle injury. 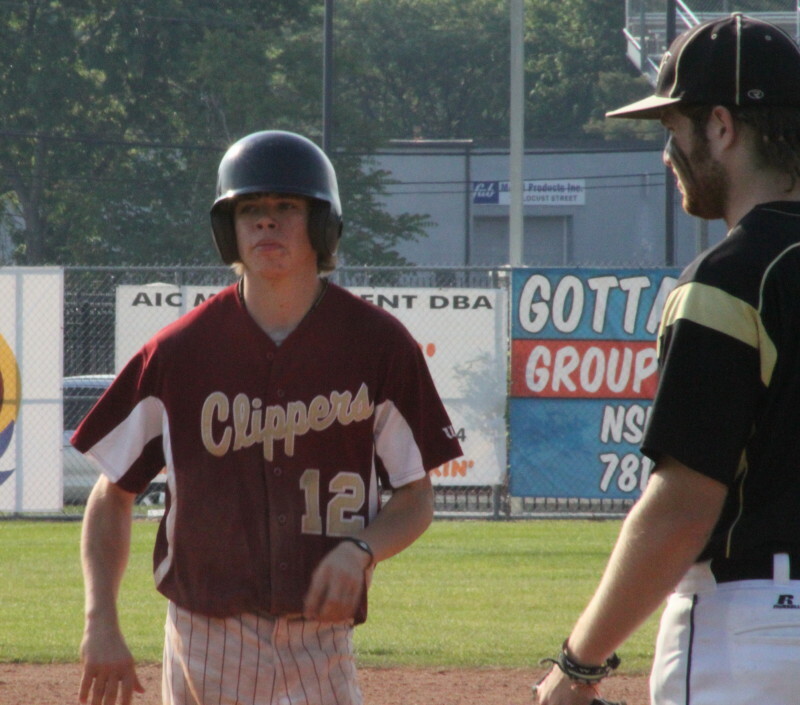 Colby Morris, Brett Fontaine, and Jim Conway had two hits apiece for Newburyport. Dave Ruggiero, Mike Davis, Jake Bugler, and Kevin Church had the hits for Bishop Fenwick. Ryan O’Connor is 9-2 for the season and has 109 strikeouts in 74 2/3 innings. He’ll be attending Bentley University this fall. The last time the Clippers played at LeLacheur Park was two years ago and I was there. They played Georgetown and lost a heartbreaker. This link is to my pictures from that game. Georgetown is in Division 4 this time around. (I put together my own stats and take my own pictures. Mistakes happen ….. unintentionally.